It has been nearly eight years since the Vancouver 2010 Cauldron was first lit by Wayne Gretzky after a rainy ride in the back of a pickup truck. This week, it will glow once again. In advance of the 2018 Winter Olympics in PyeongChang, South Korea, the Vancouver 2010 Olympic Cauldron will be relit. 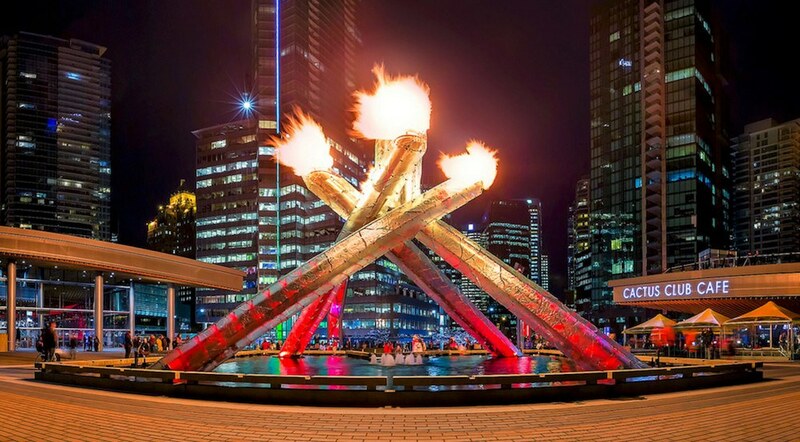 The 10-metre tall, five-burner symbol of the Olympic movement will light up on Thursday, before the Opening Ceremony, which kicks off later that evening at 3 am Vancouver time. The Cauldron will illuminated for two hours, between 5 and 7 pm. The Olympic Cauldron will be relit once more on March 17, from 5 to 7 pm, shortly before the Closing Ceremony for the Paralympic Games. In addition to burning the Olympic flame, PavCo has some other things planned. The Convention Centre, Cauldron, and facility district markers will glow red and white for the duration of the Olympic and Paralympic Games. BC Place will glow in red on select days and feature a ‘medal ceremony’ animation during opening and closing days when Canada wins a medal (with the exception of scheduled illuminations for events and community organizations). This isn’t the first time the 2010 Cauldron has been relit for the Olympic Games. It was illuminated for London 2012, and Sochi 2014 following a public outcry. It was also lit for the Summer Olympics in Rio two years ago.